As you’re probably aware, SEO is a critical marketing channel if you want your vacation rental website to grow and book more stays in 2016 and beyond. Typically, clients want to rank for highly competitive keywords like “Myrtle Beach rentals” or whichever area you’re working with. While this is possible, it’s a long path to success and requires a long investment period in terms of time and money to see it through. However, there are other low volume, low competition keywords that you should want to rank well for within Google and Bing. Those keywords being: Your Property Name. If you brand your properties with short, easy to remember names, you’ll want to make sure you capture anyone who’s looking for that rental in Google. For example, the Flamingo House in Holden Beach is rented by Brunswickland Realty. This house is unique in its design and color and generates a fair amount of people looking specifically to stay in it during the busy booking season. When searching in Google for this, your guest may use the house name followed by the area like so: “Flamingo House Holden Beach”. Here, Brunswickland Realty is doing a great job! The URL for the property ranks at the top of the page with organic search, Google has generated a Knowledge Graph snippet for the query and is showing reviews and business information. The primary reason that you want your property pages to rank well in Google Search is to not bleed branded traffic into the big listing websites. If a guest is searching for your homes, don’t let them get distracted! If you’re not careful, you can find your searches for rental properties that you manage falling into the large web traffic bucket that is VRBO/HomeAway/Flipkey/Airbnb. Why is this a big deal? Well, while the big listing sites can drive you a lot of traffic and bookings, they also aren’t always looking out for your best interests. Getting a potential guest onto VRBO.com for your area means that you’re now competing with dozens of other properties, managers and price points. Simply put, it is also easy for your guests to leave the property listing and get distracted and book elsewhere. With changes coming in 2016, your guest isn’t served well either (traveler fee, anyone?). Ideally, you want short URLs that show the name of the property in the “slug” portion of the URL. Let’s look at a few examples. In some recent website launches, we’ve also tweaked some of our URLs to include the area, view or neighborhood in the URL as well. On larger websites (think: 250+ properties), this is a solid option to organize your property pages in a logical fashion. We include the property name in each URL. Even with long URLs, Google will show the keyword searched. Next up is the most important on-page SEO factor: title tags. Simply put, title tags are the most important element that we can work on from the SEO end to help improve rankings for these property pages. Typically all of our title tags for property pages are generated based on the name of the rental business, the format the client wants to see in search results and the property name. It’s usually a formula of all three elements that allows for us to setup this title tag templates. 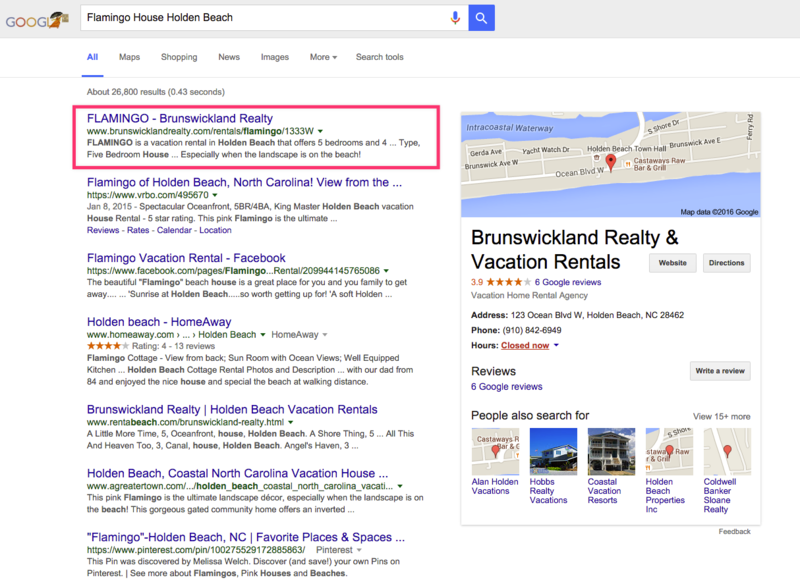 Resort Rentals of HHI uses SEO-optimized title tags. Before Google or Bing can do a good job of indexing and showing your property page URLs, they need to be able to crawl the pages. Put simply, crawling is the act of connecting together all of the many billions of documents (pages) on the web. Use Google’s robots.txt testing tool to make sure that Google can see your property pages in search. Double-check the cached version of your property pages using a site: command and make sure both the rendered version and text-only cache are readable. Search the cached version of each URL. Source: Joe Lamb Jr.
HomeAway has added Schema.org markup. Coming soon to our latest vacation rental websites is Schema.org markup. Schema.org is the standard language of the rich-snippet future of search engines. Recently, large listing websites VRBO and HomeAway have integrated Schema.org review markup into their listings results pages, earning the star markup from Google for this change. To make a great solution, we’re working through some great updates to our booking engine website code that’ll allow this markup for new websites. Making your website look great in search is an ever-evolving process. If you have any questions, feel free to reach out on Twitter.